The governor and local member of Madang with the community involved in the brutal murder of the teacher have demonstrated a very humiliating, inhuman, disrespectful and an insensitive act in returning the human head. 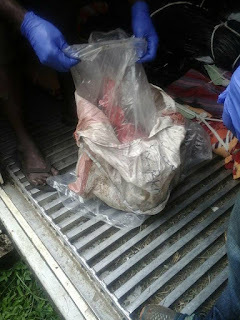 Their attitude demonstrated when the head was returned does not show a single sign of respect for the person, the people of Ialibu and the cultural understanding of how any culture would treat a body part in PNG. It further demonstrates a lack of respect for the people of ‘highlands’ region and others living and working in Madang province as a people with diverse cultural background. Plastic bag containing the victims head. To wrap the ‘head’ in a plastic bag in itself is an act of disrespect. It is not a normal Melanesian way. The teacher did not die from a war between his people and the people of Madang. He was using that same head to dispense the knowledge to the kids of Madang to be good citizens. Why wrapping the head in a plastic bag? Did he ever behead any one to deserve his head inside a plastic bag to be returned in such a way? And should people clap that hands just because a head is returned. Peter Yama and Bryan Kramer as sensible thinking leaders would rather hand over the head in a more descent Melanesian way. Simply, put it in a case with flowers and apologetically return it to the relative. A simple act like that would pave the way forward for a true peace restoration process not only for the relatives but for everyone involved in the issue. What has transpired in the process of returning the head is a totally disrespectful, insensible and a very inhuman thing done by these two so called leaders and their people. It is a human being, a teacher, a person who used that same head to educate your kids! Why should you not show some respect in handing over the head in a descent way? The way these leaders returned the head is concluded only for leadership publicity, photograph stunts, etc…. and nothing really to show their value as leaders in such circumstances. Unfortunately, the Ialibu people will never do such a disrespectful and humiliating act in handing over a body like. They will distinguish themselves from the culprit and work as leaders with the community to handover a body in a very descent and respectful way as a sign of respect for human beings, for others and especially for those who provide humanitarian services. The leaders of Madang and the people of that community should bow their heads in shame for such an abnormal cultural practice in the process undertaken to return the head. You will be remembered for your disrespectful act!